Rio Tinto and Queensland Alumina (QAL) have worked together to develop research aimed at making mine waste management safer. UQ is developing a mineral gel technology that will minimise pollution risks from alumina production, which secretes toxic waste product red mud. Rio Tinto and QAL’s financial contribution goes on top of a $180,000 Advance Queensland Industry Research Fellowship award, bringing it to almost $500,000.UQ is developing a mineral gel technology that will minimise pollution risks from alumina production, which secretes toxic waste product red mud. The two companies produce a combined $6 billion worth of alumina a year, UQ Sustainable Minerals Institute researcher Tuan Nguyen said. 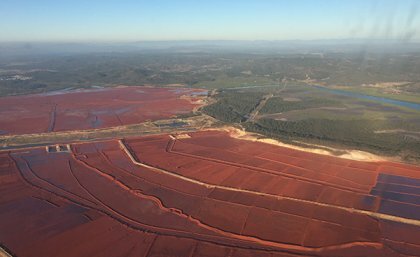 Rio Tinto and QAL accumulate millions of tonnes of red mud across 1500 hectares of dams in Central Queensland. Nguyen, who is working on research to develop cost-effective and sustainable technologies for rehabilitating red mud dams in Queensland and the Northern Territory, said storing and processing red mud safely was difficult, costly and time-consuming. “But the gel chemically links mineral grains into stable and benign soil-like structures so it can sustain plant root systems, resulting in a successful rehabilitation outcome. This will help massively with seepage management and red mud rehabilitation,” Nguyen said. Research group leader associate professor Longbin Huang said the technology was an important part of a new research theme of ecological engineering of mine wastes. “[Nguyen’s] appointment and the jump-start of this excellent funding opportunity are likely to lead to significant advancement of new technology to rehabilitate toxic red mud,” Huang said. Queensland Alumina is one of the largest alumina refineries in Australia and produced 80 per cent of its alumina on behalf of Rio Tinto.